Ep. 6: "Black Sablefish Nitsuke Set Meal of Urayasu, Chiba Prefecture"
Urayasu, Chiba. Goro has visited Urayasu before but it was in Shin-Urayasu (S1E4). This used to be a fishing town but due to industrialization and land fill expansion in the 60s and 70s, its fishing industry has since disappeared, and has become a commercial center, as well as a bedroom community. It is also well-known as the home of Tokyo Disney Resort. Sakanaya [魚屋]. It can mean fish store/market or person who deals with fish. In this episode, it means a restaurant specializing in fish and seafood. Gindara [銀だら]. Sablefish (also butterfish, black cod). Hokke [𩸽]. Arabesque greenling (fish). Mozuku [もずく]. A type of edible seaweed. In this episode, the mozuku was from Okinawa which was described as thicker than normal. Ogo or Ogonori [海髪]. Literally means "ocean hair". This was the green seaweed that Goro often sees served along with sashimi, but could not name. Takuan [沢庵 / たくあん]. Pickled daikon. Nitsuke [煮付]. 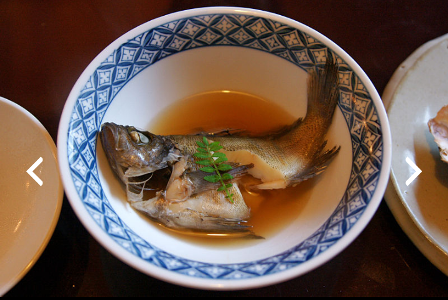 Usually fish simmered in a dark sauce made of soy sauce, sugar, mirin, sake and dashi. Saikyoyaki [西京焼]. Kyoto-style grilled fish; fish slices pickled overnight in Kyoto-style sweet white bean paste, then grilled. Shioyaki [塩焼き]. Fish grilled or boiled using salt. Kamayaki [ｶﾏ焼]. Grilled gill part only of fish. Tsukiji Fish Market [築地市場]. Where the Taisho goes to buy his stocks. It's the biggest wholesale fish and seafood market in the world, located in Tsukiji, Tokyo. 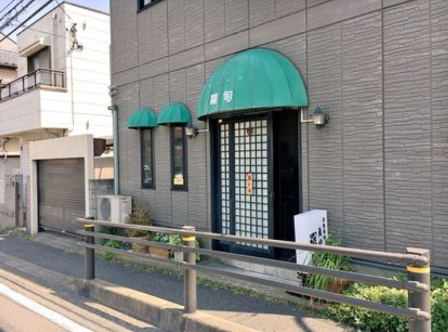 Its planned relocation to Toyosu, Koto Ward has been postponed since 2016 due to some issues with pollution. Gindara, Ginshari [銀だら 銀シャリ]. Goro kept mentioning "gindara" and playing along with the word "gin". "Ginshari" means "cooked white rice". Raten[羅甸]. Goro had difficulty reading the name of the shop since the second character [甸] is an unknown Chinese character for the Japanese. At first he read it as "shun" [旬] since it looked similar. And since there is the radical "den [田]" inside it, customers assume it is read as "Raden".